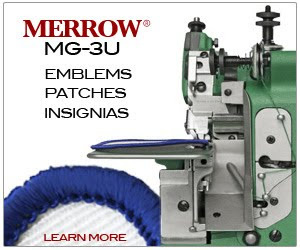 Customer Training on the MG-3U with new Merrowing Thread - Merrow Sewing Machine Co.
Today we had the pleasure of hosting Tim and Rob from Hoffman Custom Embroidery in Maryland. Tim and Rob drove up for MG-3U training, and lead technician Justin Monteiro walked them through threading, looper bending, and emblem sewing over the course of a morning. We hope that Rob and Tim enjoyed being here as much as we enjoyed having them and look forward to hearing of the success they're having with their new MG-3U!